SHIPPING VIA UPS (no P.O. Boxes): Whittington's Jerky primarily ships using UPS and requires a physical mailing address. UPS cannot deliver to a P.O. Box. SHIPPING METHODS: We offer a variety of shipping methods from standard ground to Next Day Air. We ship Monday and Thursday (except holidays*). We can only ship Next Day Air on Monday and Thursday** and we MUST receive your order by 11 a.m., CST. SHIPPING TO THE UNITED KINGDOM: We are unable to ship jerky products to the United Kingdom. *During the months of November and December we typically ship Monday through Friday (except holidays). **Next Day Air shipped on Friday will not arrive until Monday. 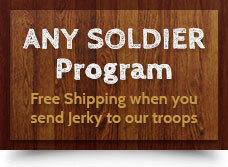 When you order one pound of any of our Jerky, we send you four individual vacuum sealed 4 oz. packages. Our Jerky should keep for 6-8 months in our original, unopened vacuum sealed package. After you open a package, we recommend you remove it from the plastic package and store it in a brown paper sack or freeze it. NEVER refrigerate!